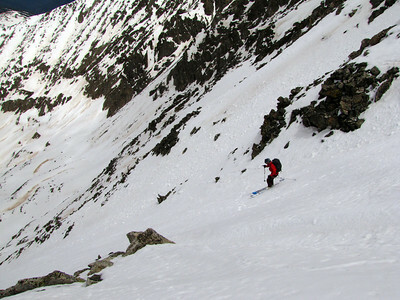 To round out Memorial Day weekend, Hans Flinch and I decided to head up Mayflower Gulch, near Fremont Pass, to check out the high 13ers Fletcher Mountain (13,951') and "Drift Peak" (~13,900'). 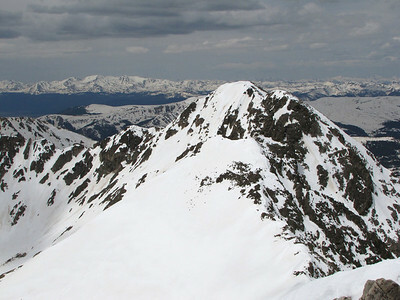 Both peaks have steep, complex routes on their northwest faces with easy access. 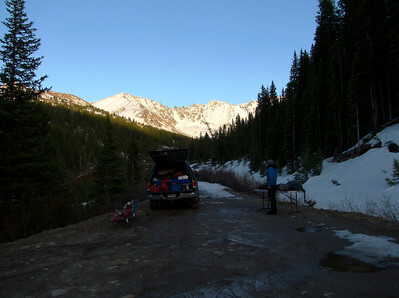 We parked the Toyota Travel Lodge about 100 yards from the winter TH the night before, and enjoyed a relaxing evening with a great view. 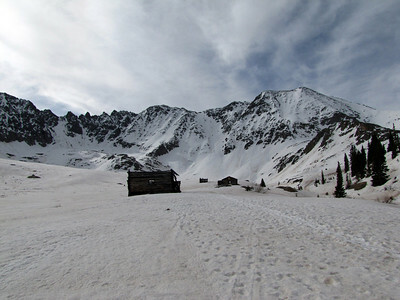 The ruins of the Boston Mine at the head of Mayflower Gulch. Fletcher is central in the back, and Drift is on the looker's right. 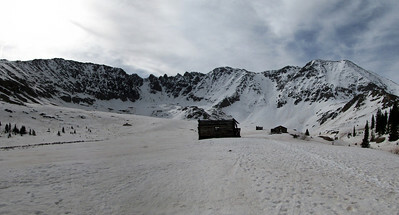 A panorama of the entire, amazing cirque. "Atlantic" on the left, Fletcher center, "Drift" right. 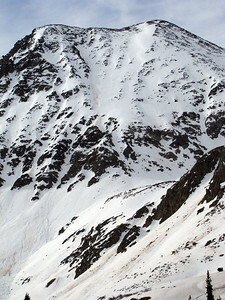 A closeup of the awesome line on "Drift's" NW face. There are multiple exit options through the lower cliff band, but route finding is certainly an issue. 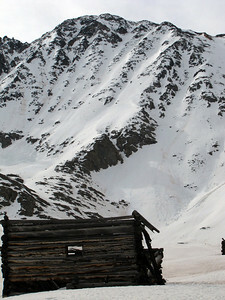 A mining ruin in front of Fletcher's NW face. At this point, we decided Fletcher would be our target for the day due to some minor snowpack concerns and the fact that the line is a bit less exposed than the line on "Drift". 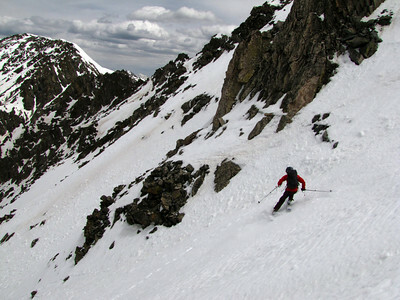 The rocky section at the top of the couloir turned out to be very reasonable, so we quickly gained the summit. Here's the view south towards Drift from the summit. 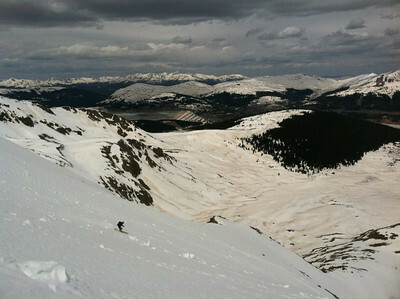 Looking north towards "Atlantic Peak," which I skied a few weeks prior with Christina Vela. Pacific and Crystal are in behind. 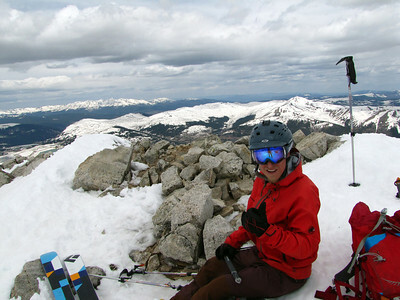 Hans on the summit, stoked for our descent. 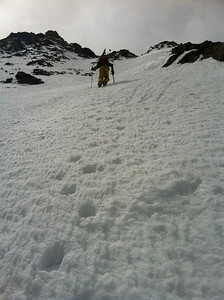 I found the snow to be surprisingly good, with firm but very edge-able snow through the choke point. Hans descends towards the choke with the rocky entrance above. 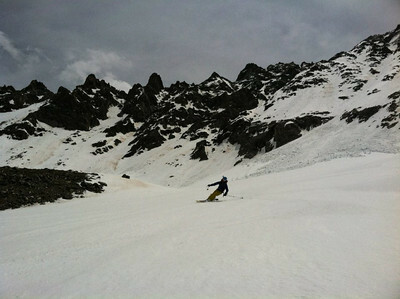 I sidestepped into the upper left corner of the photo, then made a sketchy kickturn onto the angled snow ramp. 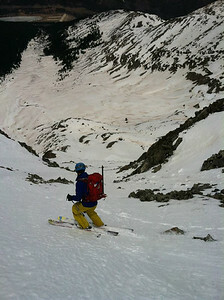 Hans chose to sidestep through the rocks directly above him to enter the couloir. Hans on the upper part of the face. Here's our route marked in red on Fletcher's NW Face. 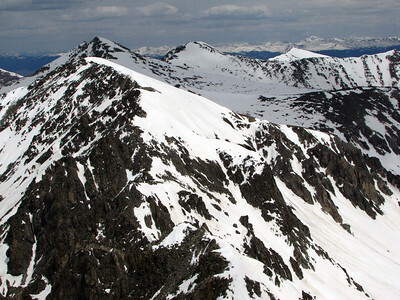 Another great high 13er descent in the books! 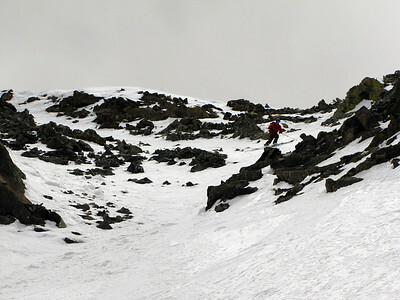 There was enough snow on the ridgeline to allow us to ski directly from the summit. A bit of billygoating through the rocky entrance led us to the top of the line, which we dubbed the Hobbit's Way in honor of the drunken hobbit mountaineer that climbed it before us. Me dropping in.